Customer experience must be the first that comes to mind when discussing business retention because today’s customers are looking for authentic connections with companies and brands. However, getting in touch with customers requires deep dialogue, in which their needs can be answered by designing tailored products/services. Companies must therefore quickly implement robust experience solutions that will keep them apace their competition. It is therefore crucial to be consistent in product/service offerings. One way to enhance the interaction between the customer and product/service provider, is to integrate these offerings into single solutions by creating a Product Service System. Because according to Aaron Fulkerson (MindTouch) « By having a solution where people can contribute information based on their skills and knowledge which is updated in real-time, companies can better serve their end-users and create loyal advocates for companies and brands. » At the end of the day, products/services that are perceived as congruent, have a positive effect perception of customers. Why are Product Service Systems important? PSS ‘consists of a mix of tangible products and intangible services designed and combined so that they jointly are capable of fulfilling final customer needs’ [Tukker & Tischner, 2006]. Now-a-days, PSS’s are being used widely as a business model in various domains, design being a major one. They help in reducing utilization of physical resources and provides a higher level of flexibility to the user in terms of usage and financial aspects. Also, these days user’s get tired or bored very quickly with products and expect something more from the interaction. PSS helps build this exact experience by developing a service which engages the user in a long-term interaction with the product. Basically, the service enables the product to have several uses and be applied in various contexts. Nike + is a PSS that provides feedback on your running session. It is a combination of a product on the shoes and an app on an iPod or iPhone that coach you on the go. PSS’s can be classified into three types based on the function they are designed for; they are Product-oriented PSS, Use-oriented PSS and Result-oriented PSS [Baines, 2007]. Fourfiniti’s expertise focuses on designing a product-oriented PSS. The nature of this process is based on user-centric design. Based on research findings by Valencia et al. , six characteristics or attributes of a PSS have been identified. These attributes are reciprocal to each other and are in relation to designing a product-oriented PSS. The attributes are Consumer empowerment, Individualization of services, Community feeling, Service involvement, Product ownership and Individual/Shared experience. For creating a solid value proposition for the user based on these attributes, the expertise of both a designer and a strategist is required. We are a design consultancy that helps technology-driven SME’s to build an encompassing product and/or service system around their innovation, which in turn delivers a positive experience to their customers, building a long and sustaining relationship. Our target group are established SME’s (small-medium enterprises), who currently have a product or have a product along with a service system. Our aim is to help such companies either build a new service system around their product or improve their current service system. Also, these are companies who have investors or relations with partners. These SME’s are very technology oriented (generally consist out of engineers) and have problems to turn their technological innovations in commercially viable products, and into human-oriented services. That is where we come in. Help the SME in expanding their customer base while at the same time staying personally connected with every single one of them. As stated earlier, our main goal is building a strong brand-customer relationship. In order to do this, one must ask themselves in every step ‘are we taking the user into account? 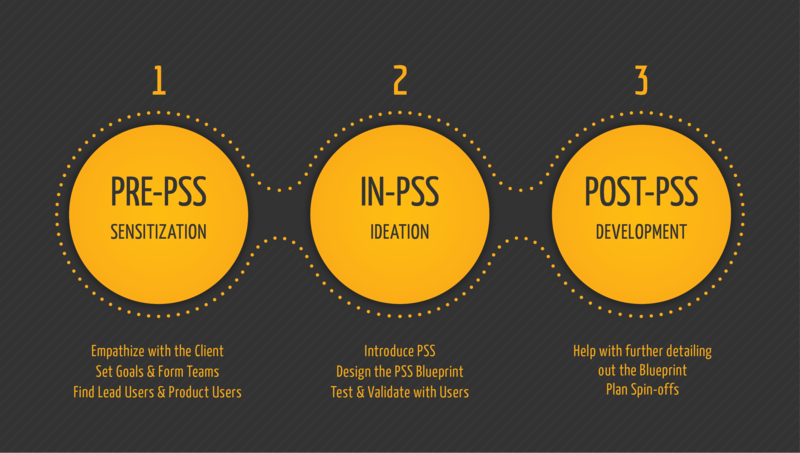 Thus we follow a user-centric approach in designing our client’s PSS. Introducing, ‘PSS in 5 days’, a 5 day workshop where we offer an experimental setting where business stakeholders can explore innovative ideas, validate them, and create/ improve an encompassing Product/Service Systems to generate an authentic connection with their users. This workshop is based on rapid co-creation, which entails collaboration with different stakeholders to develop a Product Service System. This effective methodology can bring innovations to the market in the ‘blink of an eye’. Therefore these 5 days serve as an incubator for translating cutting-edge opportunities proposed by the company into proposals meant for validation by lead users. One of the advantage is that this workshop also stimulates cross-expertise collaboration, and stimulates discussion amongst stakeholders. Especially regarding the risk-savvy stakeholders, this workshop is an excellent opportunity to explore innovative ideas that may not have been considered viable before and to put them into the market embodied in a Product/Service System. As the client’s get a glimpse of the multiple possibilities of how can their business effectively grow, the workshop is called ‘PSS in 5 days’. Our approach is divided in three phases: the pre-PSS phase, in-PSS phase, post PSS phase. The outcome of this workshop will be a tangible embodiment of the PSS blueprint, to be used in later stages for development. Next to that, new valuable information will be gained about the target group, and about the positioning of stakeholders. And in addition, this low-risk experimental setting allows companies also to understand the importance of PSS in the future, by reflecting on the question whether their user is involved well enough. Each team contains at least one lead user, one stakeholder, and one person from our staff. The rest of the teams are composed from experts in the domain within the company, pre-selected by us and the company’s managers. We act as team leaders that coordinate the process; keeping the focus on one common goal. In this phase the preparations for the workshop take place. The company will be analyzed by us, and preparatory meetings are scheduled with the right persons from the company to discuss the market and technology domain, define the company’s current status, define key objectives, and to assign roles combined with a tight agenda. Other important aspects in this phase are finding lead users and the right stakeholders to involve in these 5 days. The main goal of this phase is to prepare both ourselves and the participants from the company and to be ready for hands-on activities on day one. A minimum viable Product Service System, visualized by us and printed on a wall-size poster, to be used as a reflective tool by the company. A summarizing report made by us, mentioning the important decisions taken, and the future steps that need to be taken. Our main focus is the 5 day workshop that serves as a ‘pressure cooker’ session for developing PSS. Next to the workshop we offer spin-off projects and help the companies to develop their blueprint further to a viable outcome. The spin-off projects we offer are based on particular parts of PSS; we can take care performing thorough user research for example. We also offer coaching and consulting throughout the whole process of developing PSS. Tygron is an ICT company who has developed a new software for urban planning, also called Tygron. It’s a 3D interactive software that aids in spatial planning. The software platform allows all parties to collaborate or negotiate, individually or with team members. Their tool streamlines the planning process and sharply reduces costs for urban projects. Currently, the company has two branch offices, one in The Hague and the other in New York City. The software is the company’s sole product without any service system built around it. Now, in the software industry with great competitors such BIM Cad, who provide similar solutions, the question is how can Tygron gain a competitive advantage and also stand-out against the competition? A service system could be a possible solution because most of the software that is available in the market do not provide a holistic experience for their users. Fourfinity can help Tygron build a strong service system to enable their software become more versatile. Overview of all different kind of stakeholders involved. Adressing the needs of the customers and building a PSS can make the software more versatile. To build a service system that creates a fit between the customers and the service provider (in this case Tygron) we first start by sensitizing with the company and it’s context: we study their innovations, identify their customers and analyze their performance both technically and based on the customer’s perception. This pre-phase help us understand the possible opportunities and the right consumers and stakeholders to get involved in the next 5 days workshop. We make clear agreements with Tygron on the main objectives, and on which representatives will be involved in the workshop. During the 5 day workshop we provide all parties, including the prospective customers, a platform where discussion is stimulated around the creation of a viable PSS. Each day the assigned teams from Tygron will learn what a good service system is entails, get connected with the actual users, build their own blue print of the service system, and finally test it with their users and stakeholders. By involving actual users we will get a good insight of what they expect from the software. We guide the teams by an iterative approach: every day a draft version of the PSS blueprint will be finalized, to be reviewed the next day again. DAY 1: all employees from Tygron, the users and us will attend a discussion session regarding the meaning and importance of PSS in the future. Next, we form teams that are divided over specific domains (The User, Business and Technology). Every team consists from a Tygron user, a Tygron stakeholder, a representative from Fourfinity, and depending on the domain an expert (in this case an architecture/urban planning consultant, a marketing manager etc.). The discussion evolves around a particular successful PSS example like IBM, and learn how they built service system around their product. The objective of this day is to get a clear understanding of PSS, and to form together an aligned vision on what is regarded as a viable PSS. DAY 3: Each team will present their draft PSS blueprint to each other in a plenary session. The results from each team will be tweaked by discussion and compiled into a coherent blueprint. Outcome of the day: all assigned teams will measure and evaluate the potentials or flaws in the compiled blueprint. DAY 4: The teams will continue to work on developing a final version of the PSS, based on the evaluations from day 3. The end results will be the desired final blueprint of Tygron’s PSS. DAY 5: Finally, we will invite new users to perform a test and get a feel of the new service system. They can be any urban planner or architect that is familiar with Tygron product. 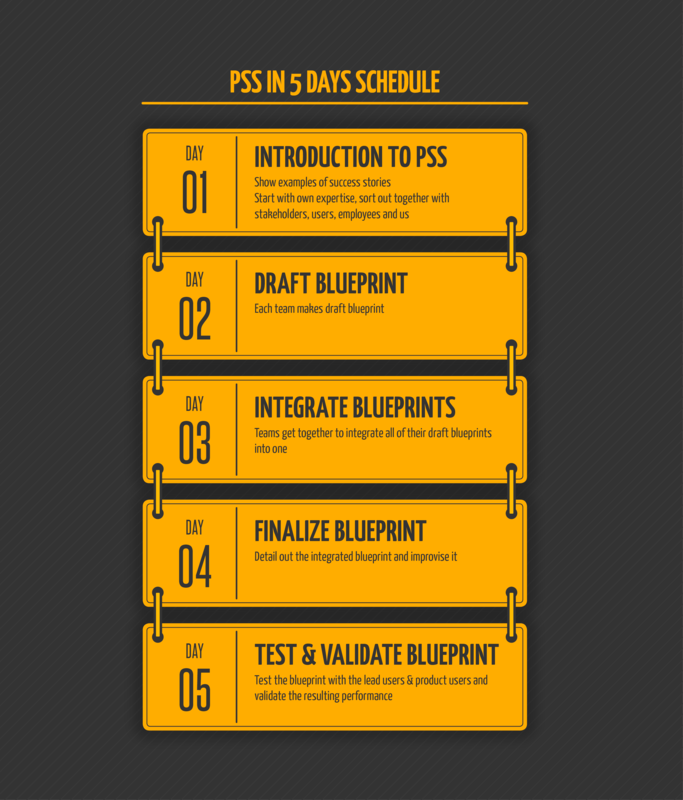 On this final stage we will test the final blueprint PSS with these users, which can evaluate and try the final PSS. Outcome of the day: with this validated (final) PSS blueprint, we can define the parts that still need to be developed. In the post-PSS phase, Fourfinity discusses with Tygron the parts that needs more development. We also make agreements on possible spin-off projects for the future, to put the PSS successfully into the market. Lock-in long term customer relationships. Baines, T. S., Lightfoot, H. W., Evans, S., Neely, A., Greenough, R., Peppard, J., Roy, R., Shehab, E., Braganza, A., Tiwari, A., Alcock, J. R., Angus, J. P., Bastl, M., Cousens, A., Irving, P., Jhonson, M., Kingston, J., Lockett, H., Martinez, V., Michele, P., Tranfield, D., Walton, I. M. and Wilson, H. (2007) State-of-the-art in product-service systems, Journal of Engineering Manufacture, vol. 221, no.10, pp 1543–1552.